An immaculate much improved 3 bedroom semi detached villa in a popular residential pocket in Clarkston. The property comprises an entrance hall, a bright and spacious living room, dining room and a modern fitted kitchen with integrated appliances. The kitchen has a door leading to the back garden that has been decked and includes a summer house. On the upper floor there are two double bedrooms, a single bedroom and a luxurious modern fitted bathroom. The property further benefits from stripped wooden floors on the ground floor, gas central heating and a monoblocked driveway. 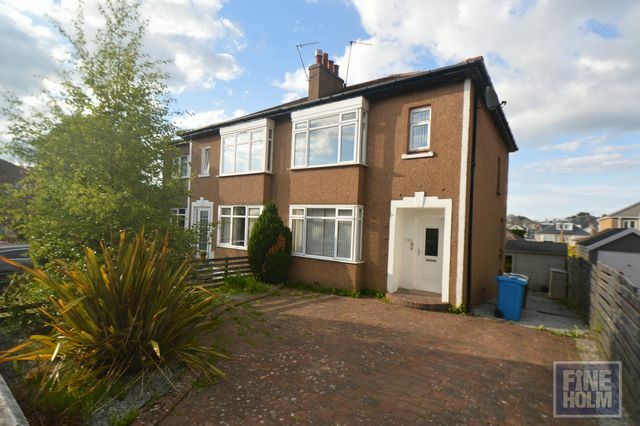 Stewart Drive is a quiet residential street but is only moments away from Clarkston toll with a number of local amenities, shops, bars & restaurants. Williamwood and Clarkston Mainline stations are close by with their direct links to Glasgow.